The Engineering Design Guide is available to assist engineers with a practical, hands-on approach to designing with Sorbothane®. This guide is advisory only. Data used is supported by empirical work. Sorbothane, Inc. offers additional technical support. Contact us if you have questions. 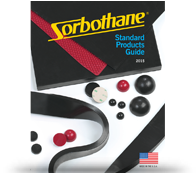 We also offer easy-to-use calculators that will help determine which of four Sorbothane® shapes would be best for your application. The shapes provided in the program will cover 90% of all needs. The data is supported empirically and experimentally. Sorbothane engineers are available to assist. If you'd prefer to have our Engineering Design Guide mailed to you, please fill out the form below.